Robots have always fascinated human race and they have replaced human beings and their skills in many fields. Automation is a buzz word and it has made many simple things in everyday life as well as tough mechanical processes in the industrial field. BioMimicking robots or robots which are designed based on some animals and creatures are so fascinating and amazing that they are already being loved for their designs and the amazing work they offer. A company called Festo has developed robots which are a copy of many animals such as kangaroo, penguins, ants etc. Not only the shape of the animal is adopted in the design part, but also the nature and the behaviour of the animals such as co-operation as a team to finish a task are implemented in these robots. Festo is a research and education based institution which concentrates mainly on bionic learning. It is located worldwide in 61 locations with 250 branches. The delicate and beautiful designs of the butterflies, the superior and complex communicating techniques of the ants etc. are implemented in these robots which make them aesthetically and technically best robots. Flying has always been a fascination with human beings. Butterflies are tiny creatures with amazing flying and co-ordination abilities. 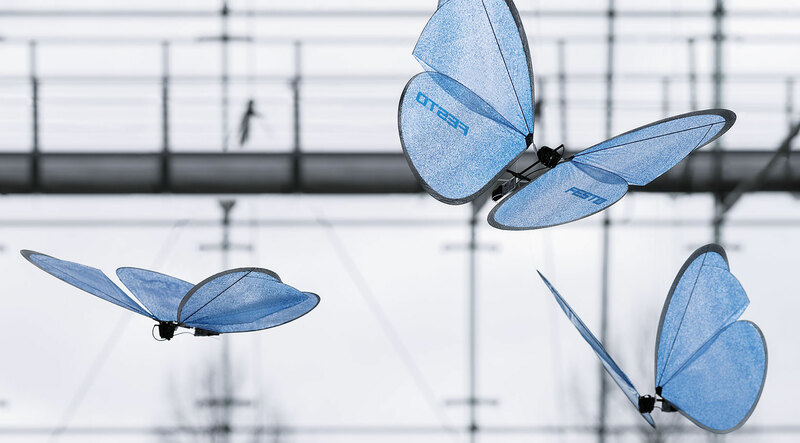 These eMotion butterflies are designed by Festo based on the delicate and lightweight features of the butterflies. The minimalistic design of the eMotion Butterflies in coordination with the intelligent networking system is a magical thing which needs to be watched. Ants are amazing creatures with their tiny bodies and wonderful communication. The network of ants which are considered superior in communication and finishing a task is implemented in Bionic Ants by Festo. The re-creation of these tiny creatures with the minimalistic design using high-end technology is just amazing. Kangaroo is a unique creature with its distinguished movement. The unique kangaroo movement is implemented in a lightweight kangaroo bionic robot. Festo was able to recreate the kangaroo with the jumping movements which can be controlled by gestures. The unique anatomy and the dynamic movement of these bionic kangaroos are just mind blowing. BionicOpter is a recreation of the dragonfly which can be said to be a masterpiece created by Festo. The light-weight structure of the dragonfly with its unique movement of features which can hover or glide in the air is just astonishing. The features such as individual movement of the wings, amplitude control of the wings implemented in the BionocOpter makes it a masterpiece. Aquajellies2.0 is a recreated version of water jellies which can swim through water in an effortless manner. These bionic Aquajellies are independent robots which can coordinate, communicate and work in a limited space. These robots which are created by Festo may change the future of waste -water management and other water related services. The beautifully created AirPenguin bionic robots can fly in the air and glide in the water. These air penguins can move in a limited space independently. These robots can be used to explore a limited space which can be used in many ways in the near future. Aqua Penguins are bionic robots which are recreated versions of water penguins. These robots can take underwater exploration to new heights. The free movement of the AquaPenguins in water with high-end torso design which can move freely is expected to do wonders in the underwater world. These brilliant robots designed by Festo which are recreated versions of various animals and creatures are expected to bring a huge change in various technological, automation and research fields. Call it a Diving Bird! or a Flying Fish!, This water-sampling drone inspired by Gannets is nothing you have ever seen before.